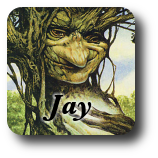 7/29/2014 - What if you could dedicate a single land toward casting a spell? Attune works a lot like suspend, but allows you to cast a spell with just one land over several turns. I can't be sure how much of a discount over the full price attune should offer, not without playtesting. Ultimately, the big question is whether this is even worth considering. It's not terrible but does it offer enough of the fun of suspend while being sufficiently simpler to justify making such a similar mechanic? There are also fiddly details we'd have to address. Attuned creatures likely need to gain haste, for the same reason suspended creatures did. Is it cool we can attune as an instant? Shouldn't we require a land of the correct basic land type? When are you putting on charge counters? When you activate the land? It feels very similar to suspend, only without the mana cost. 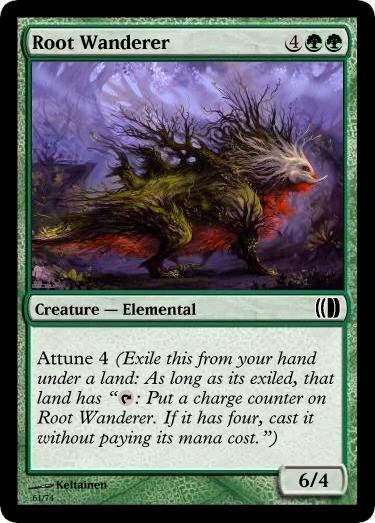 The mana cost on suspend cards feels important because that's what makes them work within the color pie. 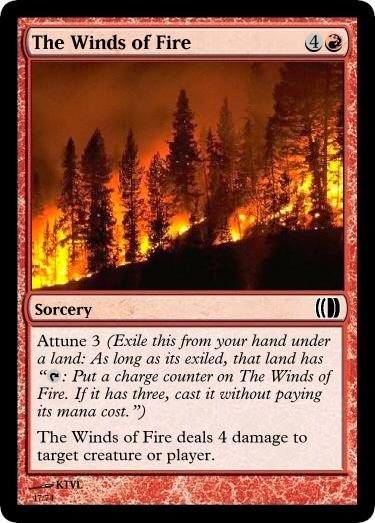 I wouldn't want a monoblue deck to be casting winds of fire. Deal 2 damage to target creature. If you overloaded this spell, deal 5 damage to that creature instead. The biggest problem would be the memory issues involved, but "doesn't untap" exists in regular Magic. If anything, it's less memory intensive than Echo. Attune could specify the corresponding basic land. Winds of Fire would only attach to Mountains. Overload is less flexible than echo, but much easier to remember and more intuitive. Making it a kicker variant was clever; making it different enough to consider printing despite echo. Interesting. My first reaction was that remembering which lands you used to cast a spell is a pain. But I think that's wrong, since you make the decision as you cast the spell, so it's easy to just put those lands aside as you're tapping them. Maybe this has keyword potential! "Attune to LANDTYPE" could be part of the phrasing for this mechanic. This opens up options such as a red creature with Attune to Island. Also, numbers may have to be worked on. This seems very abusable with land/permanent untappers. Attune to LANDTYPE is good. I like that. We want it to be abusable. How many cards did Time Spiral block make just to help players abuse Suspend? I'm still confused when this adds counters. Upkeep? Deal 5 damage to target creature or player. "Half", instead of "part"? Remembering how big my opponent's down payment was on multiple spells seems annoying; that's why suspend needed counters. The land gains a tap ability to add counters, so you add counters whenever you tap the land. Layaway would require pen and paper to track since you can pay any part in any number of increments. Half would be simple enough. You could also down-pay generic mana costs but not colored mana costs, letting you track it with counters. Why connect it to a land? Are you intending for your opponent to bounce / kill the land to pre-counter your spell? That sounds pretty feel-bad. Moving it off the land makes it too similar to suspend, I agree. You're dedicating the attuned land to casting the spell, and you can't cast it using any other mana. The reward being that you'll cast it for less mana total. I wouldn't expect opponents to hit the land much, and I wouldn't put any extra methods to do that in the set, but if they're willing to play Demolish to make your attunements risky, that's interaction. Does this allow you to cast these spells in any color? It looks like I am able to play both of these spells in a blue deck or am I reading attune incorrectly? You're reading the cards correctly, but perhaps didn't notice my note in the blog about that, or the follow-up comment on that topic. ah yes I missed those comments. Thanks haha. I think that there would either need to be some kind of in-color activation, or restriction to basics of that color in order to prevent being able to cast red spells in an all white deck with all white mana. Suspend got a lot of things wrong, but there's one improtant thing it got right: the counters should tick down rather than up. As it stands players have to track the attune number on every single card; if counters were being removed, it would be obvious when things were about to be cast. Of course, no counters would be better. I'm a fan of Layaway for exactly half. Not sure layaway is better enough than echo to warrant. I prefer overload.